Frozen shoulder is a painful condition that makes it hard to lift or move the shoulder due to tightening and thickening of the shoulder capsule. 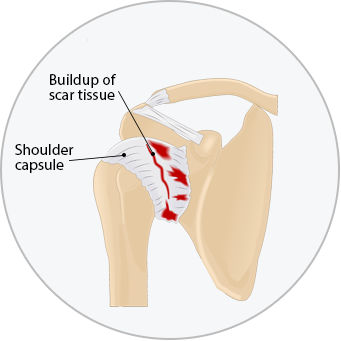 What is a Shoulder Capsule? The shoulder capsule is strong connective tissue that surrounds the bones, ligaments and tendons that make up your shoulder joint where the upper arm bone fits into the shoulder blade socket. What are the Stages of Frozen Shoulder? Freezing: Lasting anywhere from six weeks to nine months, in the freezing stage the shoulder slowly loses range of motion as pain and stiffness gradually increase. Daily activities such as reaching and stretching become more difficult and painful. Frozen: Lasting from four to twelve months, the frozen stage sees a decrease in pain, but the shoulder will remain stiff, and the muscle may begin to waste away. Everyday movements such as lifting the arm over the head may be difficult or impossible. What are the Signs and Symptoms of Frozen Shoulder? Can Frozen Shoulder go Away on its own? Yes. Frozen shoulder typically goes away on its own in one to three years after going through all of the stages. However, you can shorten your recovery time to as little as six months if you seek physiotherapy treatment which will also reduce pain and improve your range of motion. Can you Prevent Frozen Shoulder? Yes. One of the most common causes of frozen shoulder is not moving (or immobility) following a surgery, broken arm, or stroke. Following an injury, illness or accident, speak to a physiotherapist about preventative care for frozen shoulder.